Nearly 70 percent of the energy produced in the United States each year is wasted as heat. Much of that heat is less than 100 degrees Celsius and emanates from things like computers, cars or large industrial processes. Engineers at the University of California, Berkeley, have developed a thin-film system that can be applied to sources of waste heat like these to produce energy at levels unprecedented for this kind of technology. 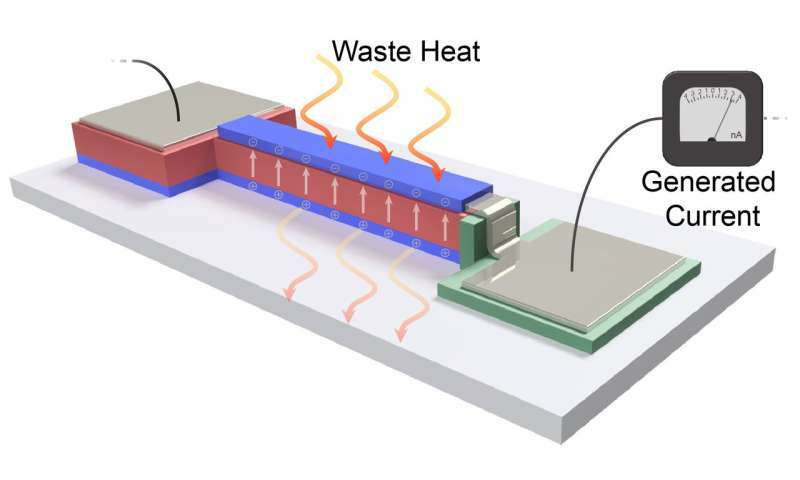 The thin-film system uses a process called pyroelectric energy conversion, which the engineers' new study demonstrates is well suited for tapping into waste-heat energy supplies below 100 degrees Celsius, called low-quality waste heat. Pyroelectric energy conversion, like many systems that turn heat into energy, works best using thermodynamic cycles, kind of like how a car engine works. But unlike the engine in your car, pyroelectric energy conversion can be realized entirely in the solid state with no moving parts as it turns waste heat into electricity. The new results suggest that this nanoscopic thin-film technology might be particularly attractive for installing on and harvesting waste heat from high-speed electronics but could have a large scope of applications. For fluctuating heat sources, the study reports that the thin film can turn waste heat into useable energy with higher energy density, power density and efficiency levels than other forms of pyroelectric energy conversion. "We know we need new energy sources, but we also need to do better at utilizing the energy we already have," said senior author Lane Martin, associate professor of materials science and engineering. "These thin films can help us squeeze more energy than we do today out of every source of energy." The research will be published April 16 in the journal Nature Materials. The research was supported, in part, by grants from the Army Research Office and the National Science Foundation. Pyroelectric behavior has been known for a long time, but accurately measuring the properties of thin-film versions of pyroelectric systems has remained a challenge. A significant contribution of the new study is to demystify that process and improve the understanding of pyroelectric physics. Martin's research team synthesized thin-film versions of materials just 50-100 nanometers thick and then, together with the group of Chris Dames, associate professor of mechanical engineering at Berkeley, fabricated and tested the pyroelectric-device structures based on these films. These structures allow the engineers to simultaneously measure the temperature and electrical currents created, and source heat to test the device's power generation capabilities - all on a film that's less than 100 nanometers thick. "By creating a thin-film device, we can get the heat into and out of this system quickly, allowing us to access pyroelectric power at unprecedented levels for heat sources that fluctuate over time," Martin said. "All we're doing is sourcing heat and applying electric fields to this system, and we can extract energy." This study reports new records for pyroelectric energy conversion energy density (1.06 Joules per cubic centimeter), power density (526 Watts per cubic centimeter) and efficiency (19 percent of Carnot efficiency, which is the standard unit of measurement for the efficiency of a heat engine). The next steps in this line of research will be to better optimize the thin-film materials to specific waste heat streams and temperatures. "Part of what we're trying to do is create a protocol that allows us to push the extremes of pyroelectric materials so that you can give me a waste-heat stream and I can get you a material optimized to address your problems," Martin said. (19 percent of Carnot efficiency, which is the standard unit of measurement for the efficiency of a heat engine). Great way to dodge saying that the actual efficiency of the device is piss-poor. 100 C isn't really waste heat either - it's hot enough to heat houses in a district heating system. it would be a total waste to cool it down to 25 C to get a tiny bit of electricity out. @Eikka: In a car engine 2/3 of total energy are wasted as heat, so you can get 7.6% more power by using the refrigerator's heat. That sentence appears to make no sense. In a big powerplant, the waste heat generated comes out significantly below 100 C, because the lower the temperature at the condenser, the higher the efficiency of the generator turbine. The coolant water temperature is typically under 30 C as it exits the powerplant. Environmental considerations also limit cooling water temperatures to below 32 C to avoid hurting plant and animal life. With such a small difference in temperature to ambient conditions, the size of the device needed to extract even small amounts of electricity would raise the cost to millions, and you essentially save nothing. Suppose for example you got river water at 15 C flowing into the plant, and the outflow is at 32 C - the maximum the law allows. So 1% of the waste energy could be recovered by extracting all the heat from the cooling water stream. Meanwhile, if we assume the steam turbine to operate between 400 C steam and 32 C at the condenser, the Carnot efficiency is 54.7%. If we drop the condenser and the cooling water temperature to 20 C by pumping more water through, then the efficiency improves to 56.5% - an improvement of 1.8% points. The remaining 5 C temperature difference isn't large enough to run any practical thermoelectric generator. This is why powerplant waste heat is not a great source of energy. At best it can be pumped around irrigation channels to thaw fields in the early spring and extend the growing season a bit. Likewise, in a CHP plant, the heat for the district heating loop isn't taken out of the power turbine's condenser. Instead, the heat is taken from the steam in the primary loop, so the heat output and the electricity output can be independently adjusted and the power turbine can always run at maximum efficiency. 1) a 100 kW engine isn't running at full power all the time. The actual average output is closer to 10 - 20 kW. 2) Only a very small portion of the waste heat goes out through the radiator. Modern engines actually struggle to put out enough waste heat to run the interior heaters. The vast majority goes out the tailpipe. BMW already tried to harness that heat using a rankine cycle turbine that extracts waste heat out of the exhaust, which is more efficient than the pyroelectric generators. The necessary heat exchangers to extract the heat out of the flow of gas were too big and too expensive. 1) If you need only 10 KW from the engine you'll get 760 W from this generator. What's the problem?